Dr. Wilbur Knight is one of the primary reasons that the University of Wyoming’s Geological Museum has long enjoyed its top-notch reputation. Knight served as the assistant territorial geologist of Wyoming from 1886-1887 and was appointed state geologist in 1898. 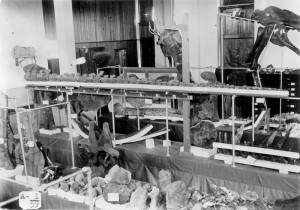 He joined University of Wyoming’s faculty in 1893, and became the curator of the Geological Museum in addition to his instructional responsibilities. Knight led many expeditions into the Wyoming heartland, famous for being one of the richest fossil regions in the United States. He was the leader of the 1899 Union Pacific Railroad Expedition in which railroad officials invited geologists and paleontologists from universities, colleges, and museums around the country to participate in a scientific expedition to Wyoming. Although Wilbur Knight died rather young, his son Samuel “Doc” Knight, a legendary Wyoming geologist in his own right, later became the curator of the museum and expanded its scope. The Geological Museum at the University of Wyoming has since become a tremendous attraction in Laramie and an asset to Wyoming. Learn more about Dr. Wilbur Knight and the University of Wyoming’s Geological Museum.